To protect against cancer causing chemicals in the environment and food. How have AntiCan Caps helped others? How do I use AntiCan Caps? A diagnosis of cancer can be a devastating blow. Even the word strikes fear into many hearts and may be seen as a death sentence. These days, however, this is not necessarily the case. As researchers find out more about how cancer develops and how best to manage it, many patients are being successfully treated and even cured of cancer. However, there is no doubt that cancer is becoming a growing epidemic and has been identified as the second most common cause of death in the UK and USA. While research strongly supports a genetic component to cancer, it is also becoming increasingly clear that environmental triggers and circumstances are instrumental in whether or not cancer will develop. In other words, a genetic predisposition to cancer will only be translated into cancer itself if there is exposure to cancer-causing agents (carcinogens) or circumstances which precipitate the cancer. Just as there are many different potential causes of cancer, so are there many different types of cancer - from hormone related cancers like prostate cancer, breast cancer, cancer of the cervix and testicular cancer, to cancers of the blood like leukemia and lymphoma. The three main options for treating cancer in conventional medicine are surgery, radiation therapy and chemotherapy. The most appropriate treatment or treatment combination will depend on the type of cancer, the location, the stage of the disease and whether it has spread around the body. Removing the tumor or affected area by surgery can prevent spread of the cancer and is often the option that will be most likely to cure the disease completely. Surgery isn’t always appropriate however, for example, if the cancer has already spread to different parts of the body or for certain types of cancer which are not localized, like leukemia (cancer of the white blood cells). Radiation therapy may be used alone or after surgery in order to destroy any remaining cancer tissue that was not removed. This treatment is used locally. The radiation is focused on a specific area where it will kill cells which are dividing rapidly - like cancer cells. Chemotherapy is the third treatment option. This is best suited for cancer that is present in several places in the body or types that aren’t effectively treated by surgery or radiation. Chemotherapy uses drugs to kill rapidly dividing cells (like cancer cells) and this is the reason for the numerous side-effects of this treatment. While conventional medicine has made many advances made in the treatment of cancer, critics point out that while the treatment is often 'successful', the side effects frequently result in further damage to the system. The mortality rate of cancer patients due to the side effects of treatment as well as hospital acquired infections is seen by many as unacceptably high. Conventional treatments for cancer can be effective in treating the tumor growth or cancer itself, but the side effects, as noted, can be extremely harsh and can compromise the health of the rest of the body. Though conventional treatments may arguably be a “necessary evil” in cancer management, complementary therapies and natural remedies have a number of important roles to play in boosting health and the immune system, limiting damage of conventional treatments as well as treating the cancer itself. A number of herbs have proven anti-tumor and anti-oxidant properties and can contribute significantly to a successful cancer treatment programme, while others are able to protect the system against the harmful effects of conventional cancer treatments, resulting in improved recovery and increased resistance to relapse. Natural remedies are also beneficial for people wanting to protect themselves against developing cancer in the first place. There is a great deal of research supporting the anti-tumor properties of a number of herbal ingredients with strong anti-oxidant properties. Natural remedies that strengthen the immune system can also help the body to fight against the development of cancer cells before they become a problem. 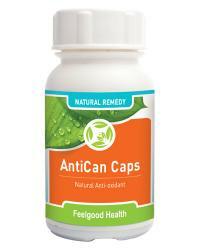 AntiCan Caps are a 100% safe and effective natural remedy for cancer support. Containing herbal and homeopathic ingredients with both traditional and clinically proven effectiveness in the treatment of cancer, AntiCan Caps may be used by people wanting to protect their systems from cancer as well as by cancer patients undergoing treatment or in remission. Withania somnifera (Ashwagandha) is also called 'Indian ginseng' and is one of the most important Ayurvedic tonic herbs, assisting with growth, health and vigor. Regular use can help to nourish the blood and increase hemoglobin levels. Recent studies have demonstrated that Ashwagandha has anti-tumor properties and can help to prevent or slow the development of cancers. It is an effective anti-inflammatory and has excellent calming properties. This herb is often recommended as a tonic to assist with recovery after illness and can be a significant benefit for people recovering from conventional cancer treatment or for maintaining remission. Curcuma longa (Turmeric): Evidence from research on the anti-cancer potential of Turmeric has shown particular effectiveness on cancer of the prostate, breast, skin and colon. This herb can also protect the liver from damaging substances such as those used in chemotherapy. Conium mac (30C) is a homeopathic remedy for swollen glands and cancerous tumors. It is also effective for painful breasts and prostate enlargement. Urinary and digestive difficulties such as painful urination, indigestion and constipation are also addressed by Conium mac. AntiCan Caps contain NO artificial flavourants, colourants or preservatives. AntiCan Caps are available in bottles of 60 vege-capsules. Use AntiCan Caps preventatively or as part of a cancer treatment program. Preventative use: Take one capsule twice daily. Chronic use: Take 2 - 3 capsules three times a day. Note: May be used together with ChemoCleanse Herbal Formula. Degree and speed of improvement will differ between individuals, depending on many factors. With regular use, gradual improvement in health, appetite, energy and vitality will be noticed. One bottle of 60 capsules will last one month at preventative dose and approximately 10 days at chronic dosage. See our Buy 3 Get 1 Free Special Offer for a 25% saving. Can I use AntiCan Caps alongside my conventional treatments? Generally this is safe to do. AntiCan is an excellent supportive remedy that will help to reduce the adverse effects of cancer treatment on your general health. As with all medicines and supplements, it is a good idea to discuss your use of AntiCan with your health care provider as he/she is responsible for monitoring your progress during treatment. What are the side-effects of AntiCan Caps? AntiCan is a 100% natural, herbal remedy manufactured with the full spectrum method. All individual ingredients have a very high safety profile. This means that AntiCan is generally well-tolerated without any side-effects at all. Cancer is prevalent in my family. Should I use this product for long-term cancer prevention? Anyone over the age of 45 or with a family history of cancer can benefit from using AntiCan Caps preventatively. This natural remedy will prevent formation of cancer cells and strengthen the immune system to fight and neutralize any potential cancer-causing substances. What else can I do to improve my health after being diagnosed with cancer? There are a number of things you can do to improve your overall health as well as optimize your chances of becoming or staying cancer-free. Eat a healthy and balanced diet high in fresh, organic foods. Avoid all synthetic ingredients like preservatives, colorants and flavorants found in processed food. Regular, moderate exercise can keep you feeling healthy and strong and will help to reduce the tiredness and side-effects caused by cancer treatment. Be sure to consult your health care provider before starting any new exercise routine. Discuss supplementation with your health provider. Certain supplements have proven cancer prevention properties, particularly Vitamins C and E and the mineral selenium. Read as widely as possible in order to be fully informed about available cancer treatments and prevention programs. At the beginning of the year a lump in my breast was found to be malignant and, after battling breast cancer 7 years ago, I knew what I was in for. I ended up having the works: a mastectomy, radiation and then chemo. By the end of it I felt shattered and really began to focus on building up my health and strength. I ate organic food (and still do), took plenty of time to rest and used both your AntiCan and ChemoCleanse products. I really feel that these remedies have helped me tremendously as I recovered quickly from the after-effects of chemo and am feeling well and strong only a few months after being discharged from hospital. My husband has been battling prostate cancer and has had both surgery and radiation therapy. After his diagnosis and treatment I noticed a dramatic change in his energy levels, strength and zest for life. I was even more worried about this than the actual cancer which had responded well to treatment. I ordered your AntiCan Caps for him and have started to see the man I knew before coming back. He is playing golf again and has a much healthier appetite and skin color. This remedy has done him a world of good - thank you.